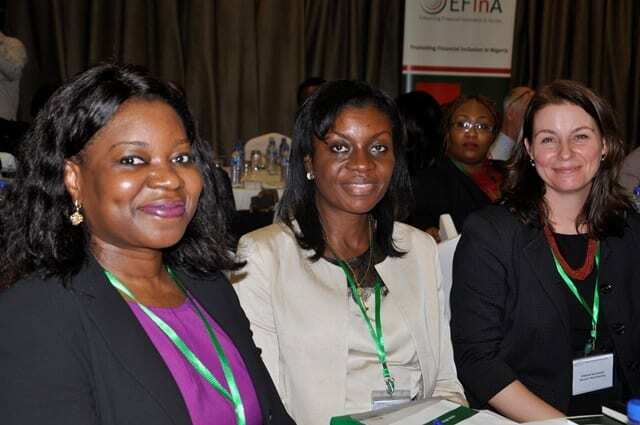 Our Savings Manager Jennifer McDonald attended Enhancing Financial Innovation & Access’s (EFInA) inaugural Women’s Financial Inclusion Forum in Lagos on November 14. Jennifer presented global best practices for women’s financial inclusion, sharing Women’s World Banking’s experience in developing products that enhance women’s financial inclusion. Lagos, November 14 2013: Enhancing Financial Innovation & Access (EFInA) hosted their inaugural Women’s Financial Inclusion Forum to share ideas and discuss practical strategies to enhance financial inclusion for women in Nigeria. EFInA Board member Mrs. Anino Emuwa opened the forum by explaining that EFInA has specifically identified women as a focus area in its 5-Year Strategy, as women remain a relatively underserved group. She encouraged participants at the forum to develop innovative solutions that would enhance women’s financial inclusion in Nigeria. International guest speaker, Ms. Jennifer McDonald, Savings Manager, Women’s World Banking (WWB), presented global best practices for women’s financial inclusion, sharing her organisation’s experience in developing products that enhance women’s financial inclusion. Ms. McDonald discussed WWB’s work with Diamond Bank on the BETA Savings product, which is targeted at unbanked and under-banked Nigerians, especially women. In 2011, EFInA awarded Diamond Bank a Technical Assistance Grant to develop and pilot the BETA Savings product.